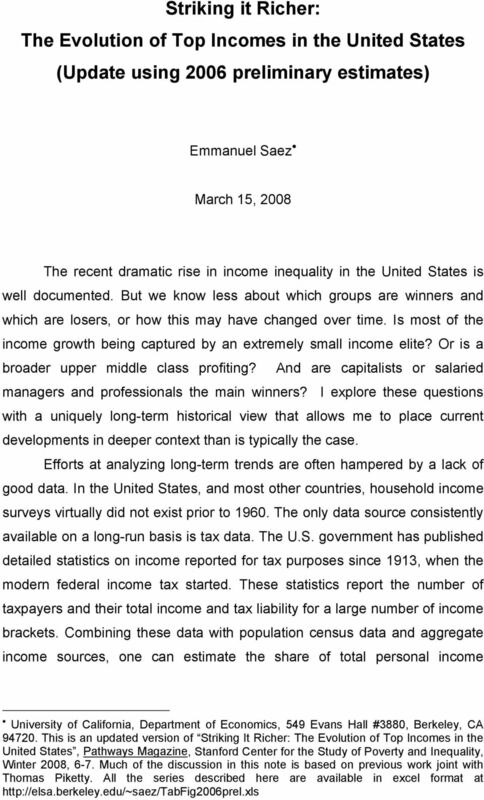 Download "Striking it Richer: The Evolution of Top Incomes in the United States (Update using 2006 preliminary estimates)"
2 1 accruing to various upper-income groups, such as the top 10 percent or top 1 percent. We define income as the sum of all income components reported on tax returns (wages and salaries, pensions received, profits from businesses, capital income such as dividends, interest, or rents, and realized capital gains) before individual income taxes. We exclude government transfers such as Social Security retirement benefits or unemployment compensation benefits from our income definition. Therefore, our income measure is defined as market income before individual income taxes. 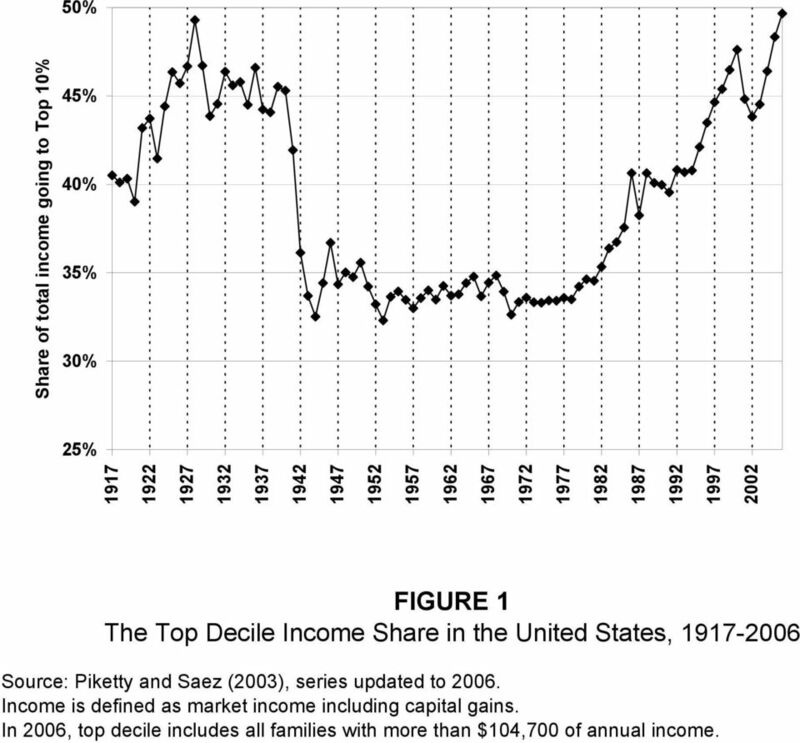 Evidence on U.S. top income shares Figure 1 presents the income share of the top decile from 1917 to 2006 in the United States. In 2006, the top decile includes all families with market income above $104,700. The overall pattern of the top decile share over the century is U-shaped. 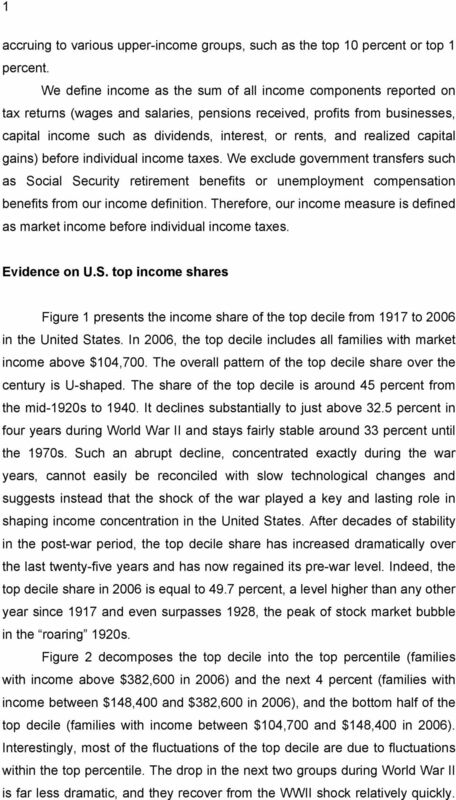 The share of the top decile is around 45 percent from the mid-1920s to It declines substantially to just above 32.5 percent in four years during World War II and stays fairly stable around 33 percent until the 1970s. Such an abrupt decline, concentrated exactly during the war years, cannot easily be reconciled with slow technological changes and suggests instead that the shock of the war played a key and lasting role in shaping income concentration in the United States. After decades of stability in the post-war period, the top decile share has increased dramatically over the last twenty-five years and has now regained its pre-war level. Indeed, the top decile share in 2006 is equal to 49.7 percent, a level higher than any other year since 1917 and even surpasses 1928, the peak of stock market bubble in the roaring 1920s. 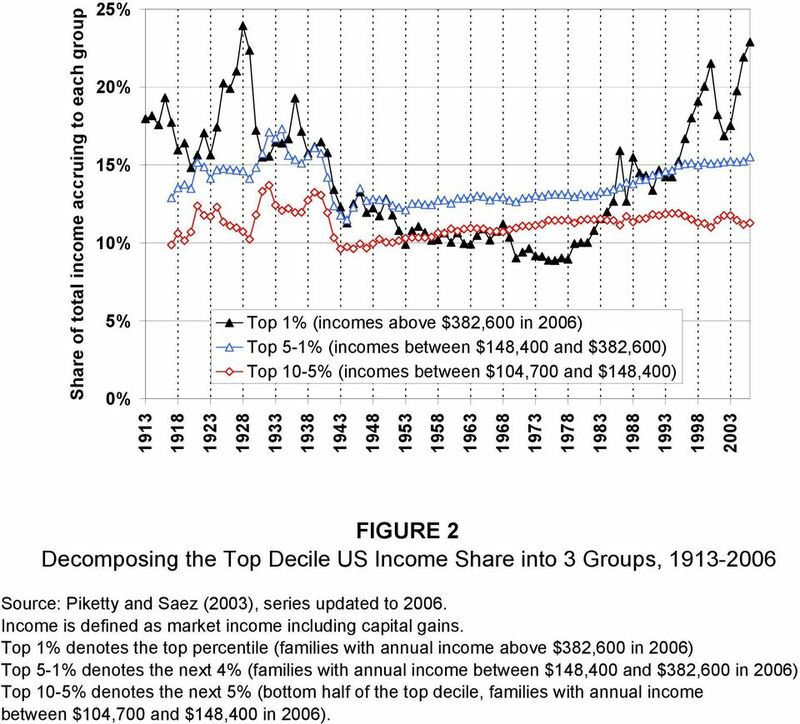 Figure 2 decomposes the top decile into the top percentile (families with income above $382,600 in 2006) and the next 4 percent (families with income between $148,400 and $382,600 in 2006), and the bottom half of the top decile (families with income between $104,700 and $148,400 in 2006). Interestingly, most of the fluctuations of the top decile are due to fluctuations within the top percentile. The drop in the next two groups during World War II is far less dramatic, and they recover from the WWII shock relatively quickly. 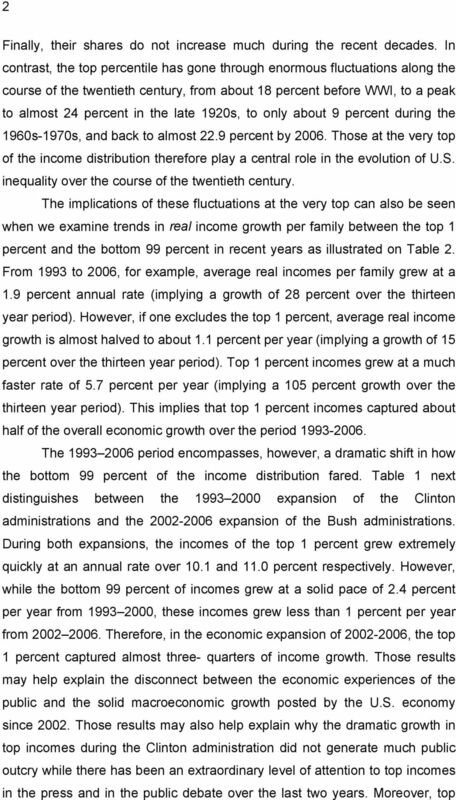 4 3 income tax rates went up in 1993 during the Clinton administration (and hence a larger share of the gains made by top incomes was redistributed) while top income tax rates went down in 2001 during the Bush administration. The top percentile share declined during WWI, recovered during the 1920s boom, and declined again during the great depression and WWII. This very specific timing, together with the fact that very high incomes account for a disproportionate share of the total decline in inequality, strongly suggests that the shocks incurred by capital owners during 1914 to 1945 (depression and wars) played a key role. 1 Indeed, from 1913 and up to the 1970s, very top incomes were mostly composed of capital income (mostly dividend income) and to a smaller extent business income, the wage income share being very modest. Therefore, the large decline of top incomes observed during the period is predominantly a capital income phenomenon. Interestingly, the income composition pattern at the very top has changed considerably over the century. The share of wage and salary income has increased sharply from the 1920s to the present, and especially since the 1970s. Therefore, a significant fraction of the surge in top incomes since 1970 is due to an explosion of top wages and salaries. Indeed, estimates based purely on wages and salaries show that the share of total wages and salaries earned by the top 1 percent wage income earners has jumped from 5.1 percent in 1970 to 12.0 percent in Evidence based on the wealth distribution is consistent with those facts. 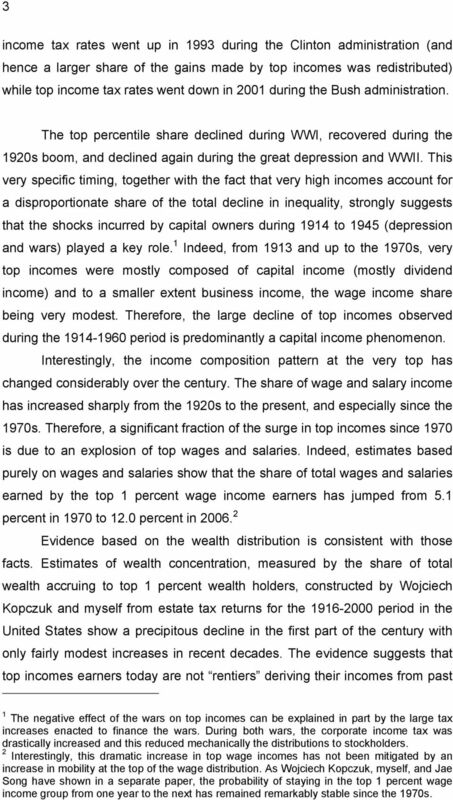 Estimates of wealth concentration, measured by the share of total wealth accruing to top 1 percent wealth holders, constructed by Wojciech Kopczuk and myself from estate tax returns for the period in the United States show a precipitous decline in the first part of the century with only fairly modest increases in recent decades. The evidence suggests that top incomes earners today are not rentiers deriving their incomes from past 1 The negative effect of the wars on top incomes can be explained in part by the large tax increases enacted to finance the wars. During both wars, the corporate income tax was drastically increased and this reduced mechanically the distributions to stockholders. 2 Interestingly, this dramatic increase in top wage incomes has not been mitigated by an increase in mobility at the top of the wage distribution. As Wojciech Kopczuk, myself, and Jae Song have shown in a separate paper, the probability of staying in the top 1 percent wage income group from one year to the next has remained remarkably stable since the 1970s. 5 4 wealth but rather are working rich, highly paid employees or new entrepreneurs who have not yet accumulated fortunes comparable to those accumulated during the Gilded Age. Such a pattern might not last for very long. The possible repeal of the federal tax on large estates in coming years would certainly accelerate the path toward the reconstitution of the great wealth concentration that existed in the U.S. economy before the Great Depression. The labor market has been creating much more inequality over the last thirty years, with the very top earners capturing a large fraction of macroeconomic productivity gains. 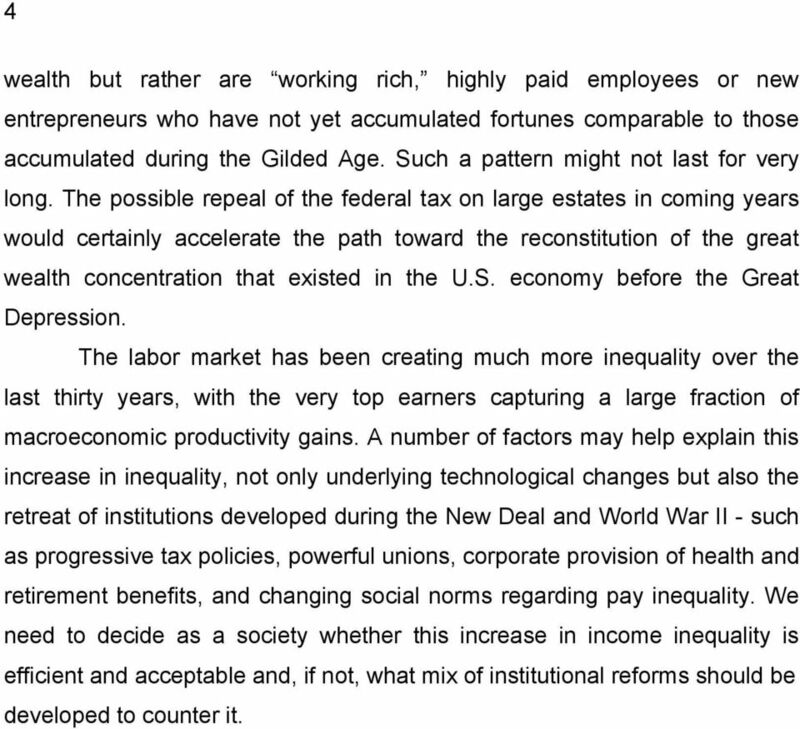 A number of factors may help explain this increase in inequality, not only underlying technological changes but also the retreat of institutions developed during the New Deal and World War II - such as progressive tax policies, powerful unions, corporate provision of health and retirement benefits, and changing social norms regarding pay inequality. We need to decide as a society whether this increase in income inequality is efficient and acceptable and, if not, what mix of institutional reforms should be developed to counter it. 6 50% 45% 40% 35% 30% 25% Share of total income going to Top 10% FIGURE 1 The Top Decile Income Share in the United States, Source: Piketty and Saez (2003), series updated to Income is defined as market income including capital gains. In 2006, top decile includes all families with more than $104,700 of annual income. 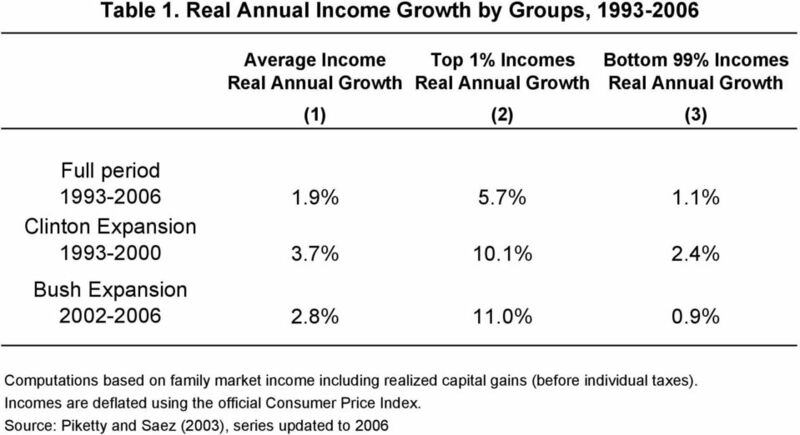 7 Share of total income accruing to each group 25% 20% 15% 10% 5% 0% Top 1% (incomes above $382,600 in 2006) Top 5-1% (incomes between $148,400 and $382,600) Top 10-5% (incomes between $104,700 and $148,400) FIGURE 2 Decomposing the Top Decile US Income Share into 3 Groups, Source: Piketty and Saez (2003), series updated to Income is defined as market income including capital gains. Top 1% denotes the top percentile (families with annual income above $382,600 in 2006) Top 5-1% denotes the next 4% (families with annual income between $148,400 and $382,600 in 2006) Top 10-5% denotes the next 5% (bottom half of the top decile, families with annual income between $104,700 and $148,400 in 2006). Economic Policy Challenges for the 'Social Market Economy' in a Globalized World: Old wine in new skins? Introduction to Macroeconomics. Ing. Mansoor Maitah Ph.D. et Ph.D. Agenda. Introduction to Macroeconomics. What Macroeconomics Is About. What Macroeconomics Is About. What Macroeconomics Is About. Perspective. Economic and Market. A Productivity Problem? Aggregate Demand and Aggregate Supply Ing. Mansoor Maitah Ph.D. et Ph.D.
Why is California s Unemployment Rate so High and what does it Mean for the State s Economic Future?